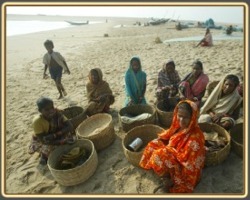 About 100, 000 traditional fishworkers earn their livelihood from marine fishing in Orissa coast. Out of these 52,500 are active sea going fishermen and rest engage in shore based fishing activities. Throughout the coast the crafts used consist of shore-based traditional/ artisanal non-motorized and small-motorized crafts e.g. wooden boats and fibre reinforced beach landing crafts known variously as ‘tepa’, nauka/ nava, balal tepa, catamaran and the fibre BLCs etc. However in the coastal areas of Jagatsinghpur, Kendrapara and Bhadrakh there are mechanised boats using non-mechanised (manual) fishing methods. They all use various types of gill nets in their fishing operations. Traditional fishermen must be made partners in conservation efforts at all levels. No traditional fishing gear should be banned without adequate and scientific study and data. Fishworkers displaced due to ban on any particular gear should be provided with adequate financial assistance for shifting to any other allowable gear. Incase of complete ban on any particular area for a particular period, all affected fishermen of that are must be compensated for the loss of income for the same period. Adequate financial allocations for this purpose must be a component of the conservation program. Traditonal fisher men using traditional gears should be differentiated from Mechanised gears like trawling. In the year 1998 the High Power Committee of the State Government recommended that the Sanctuary be divided into a core and buffer zone where no fishing would be allowed in the core area but certain fishing practices would be allowed in the buffer area. At present the Gahirmatha Marine Sanctuary comprises of a core and a buffer zone. 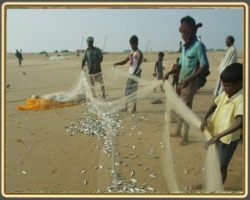 Most of the fishing areas [the waters lying between the Barunei river mouth and extending to the southern end of the Marine Sanctuary i.e the Kharnasi creek and the villages of Batighar, Kharnasi, Barkoli etc] on the Gahirmatha coast lie in the core area, which extends for 10 kms from the coastline into the waters. The buffer area of the Sanctuary where traditional boats are permitted to continue fishing comprises of waters lying between the 10 –20 km zone away from the coast. Several hasty and unthinking measures have been initiated by the Orissa State Government in relation to turtle conservation. The most recent of all such measures is initiating the process of declaring the Devi and Rushikulya areas as Marine Sanctuaries. It is a real apprehension of the local fisherfolk based on prior real incidents that the creation of these two new Marine Sanctuaries in Devi and Rushikulya mouths will only lead to more harassment from the field Forest Department. 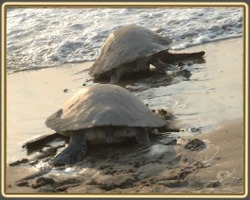 It must be stated that these two areas have a history of turtle protection and turtle field research. Alienating these communities will not serve the purpose of conservation ever. Marine fisherfolk in Orissa are one of the most backward communities. ‘Development’ has meant little for this community. Very few fishing villages have a good road, safe drinking water, electricity, school or any medical facility. Better-located fishing villages with good communication facilities have been ‘developed’ as tourist centers – virtually pushing the fisherfolk out of place of work. The rest remains remote and neglected. Most of them live in thatched or mud cottages and remain highly vulnerable to cyclone, flood and other natural calamities, which is frequent in this part of the country. Fishers and turtle, shark etc. lived in harmony since ages without jeopardizing each ones survival. But due to various reasons beyond the reach of our coastal fishermen some aquatic species e.g. turtle, shark, crocodile etc. are under stress. Unfortunately the traditional fisher people are made to bear the brunt of restoration and conservation schemes/ programs – in many cases without the backing of proper scientific evidence.